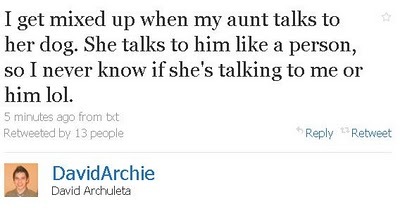 David Archuleta Twittered – I get mixed up when my aunt talks to her dog. 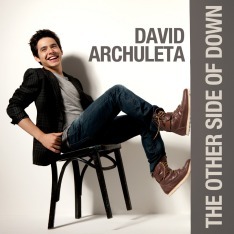 David is more entertaining than watching “Comedy Central”! Pure comedy comes from life’s experiences and there is nothing funnier than David experiencing life! Haha! I know right?! Too funny. Gosh! David is genetically funny. I think he has many funny bones. I remember how he and David Cook interacted with ‘wry sense of humor’ and great comedic timing. I thought they’d make a great comedy duo for a new television show! I tweeted to David that he should always answer his aunt and maybe she’d say, “Good boy,” and give him a biscuit.